Day One is a big leap into a big school that signals a fresh beginning and the first tentative steps on a journey that will bring them ultimately to a black tie and blazer, manhood and beyond. Day One for Year 5 at SPC is a big day. One that remains in the memory bank for a long, long time. 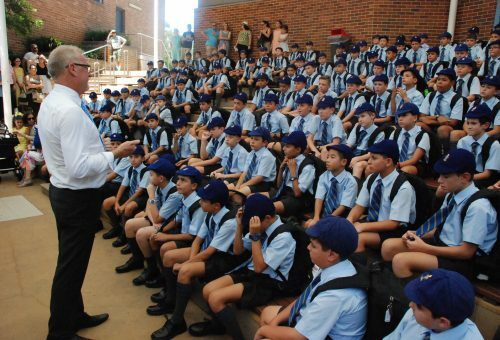 On Monday January 30, the 2017 Year 5 cohort took the big leap, the eagerly anticipated first day of many, many more at St Patrick’s College, Strathfield. Fresh faced, nervous, but excited, feeling the tug of a school tie for maybe the first time, a yard full of parents watched while their precious boys took up their positions in the Powell Pavilion. The boys listened intently to our new principal Dr Wattam as he spoke of his own nervousness and how SPC was new to him as well, then got their first glimpse of their teacher for 2017 as their names were read out. The first day at a new school is always challenging but our boys were up for it, greeting the challenge gamely, keen to impress. The day finished with some well deserved refreshments and a happy reunion with parents.